They lost everything to ISIS. They are mothers. Wives. Daughters. They live in tents and shipping containers. But they are not victims. They are refugees with a gift for making beautiful, natural, Iraqi soap—free of the chemicals and dyes usually found in the commercial variety. What’s special about their soap is not just what goes into it. It’s what it does. Every bar they sell helps them grow their business. Feed their families. Put their children back in school. Every bar helps them reclaim what ISIS tried to destroy. Not through a handout, but through the work of their own hands. 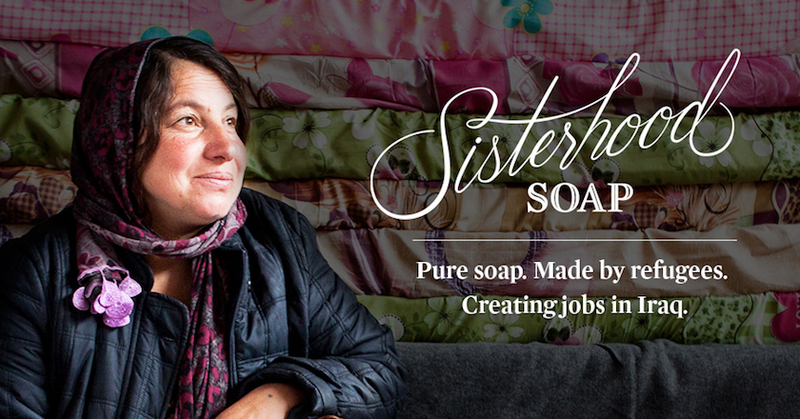 Now they’d like to share their soap with you, along with an invitation to empower even more refugee sisters. This Mother’s Day, we’re bringing a limited supply of refugee-made soap to the U.S. Most of their soap is sold closer to home, strengthening the local economy. But they also wanted to share their handiwork with you. Each bar is made from 100% pure ingredients. With the money they earn selling their soap, refugee moms can provide for their children and rebuild their lives. You can buy Sisterhood Soap for $10 per bar (plus $5 flat-rate shipping, regardless of order size). There are just 1,000 bars available, though—when they’re gone, they’re gone! This is about so much more than bars of soap. We’re asking you to join a global sisterhood, who that won’t let ISIS have the last word over these women’s lives. We’re asking you to show sisters, mothers, and daughters in Iraq that they are not forgotten. We’re asking you to empower more soapmakers like Gozê and her sister Sozan—so they can flourish now, rather than waiting until ISIS is no more. This is about standing with our refugee sisters day by day, month by month. We’ve helped Gozê, Sozan, and others build thriving businesses. Today, they’re earning enough to provide for their families. But there are many other refugees still waiting for their opportunity. You can help them through your monthly gift of $30. When you empower a refugee, you grow the sisterhood. You stop ISIS from having the last word over her life. You offer families in Iraq dignity over dependence. You create hope in one of the hardest places on earth.